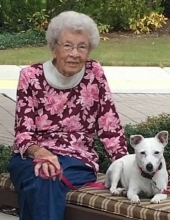 Frances Wynn Moore, 94, of Peachtree City, Georgia, passed away Saturday, March 30, at Piedmont Fayette Hospital in Fayetteville after a brief illness. A Carrollton native, Frances was born on January 13, 1925, to the late Ruth Gladney Wynn and Sydney Wynn. Frances was preceded in death by her husband of 51 years, William (Bill) N. Moore, and her brother, Frank Wynn of Carrollton. She is survived by her son, William Anthony (Tony) Moore of Forest Park; daughter-in-law, Elizabeth (Betty) Moore of Fayetteville; granddaughters, Kerri (Bobby) Rose of Senoia and Ginger Moore Mahlbacher of Atlanta. Frances had six great-grandchildren: Keith Hall, Erin Mahlbacher, Joey Mahlbacher, Connor Mahlbacher and step-great-grandchildren, Austin Rose and Lexie Rose; and step-grandchild, Sarah (Jon) Williams of Jacksonville, FL and step-great-grandchildren, Taylor Williams and Killian Williams. She was also close to many nieces and nephews. After a 40-year career in the Accounting Department with AT&T (BellSouth), Frances took an early retirement so that she and Bill could travel the United States and beyond. After spending most of her adult years in Forest Park, Frances moved to Peachtree City in 2017. Even though Frances claimed to be shy, she had many friends from her years with the phone company, from her almost 70 years as a member of Jones Memorial United Methodist Church in Lake City, and from her last years at Arbor Terrace in Peachtree City. She was a voracious reader, enjoying novels and books of poetry. She also was known as a wonderful cook and baker. Frances dearly loved her little Jack Russell Terrier, Dolly, and her neighbors enjoyed seeing Dolly “walk” Frances each day. Friends and family always knew her greatest source of love and pride always belonged to her granddaughters, Kerri and Ginger and then to their children. A graveside memorial service will be held at Sherwood Memorial Park Cemetery at 1:00 PM. on Saturday, April 13, 2019. Her pastor, Dr. Richard C. Long of Jones Memorial will officiate. A reception will follow the service at the home of her granddaughter, Kerri Rose, 26 Honey Tree Lane, Senoia Georgia. Donations may be made in her memory to Jones Memorial United Methodist Church, 5320 Phillips Drive, Lake City, Georgia 30260 or to Fayette Humane Society, P.O. Box 244, Fayetteville, Georgia, 30214. To send flowers or a remembrance gift to the family of Frances Wynn Moore, please visit our Tribute Store. "Email Address" would like to share the life celebration of Frances Wynn Moore. Click on the "link" to go to share a favorite memory or leave a condolence message for the family.